Mum’s Helping Hands provide a quality, comprehensive office cleaning service to businesses in Nottingham and surrounding cities. The appearance of your premises says a lot about your business. It creates a lasting first impression with visitors, and staff working in a clean and healthy environment feel valued and actually perform better. Our service is reliable, consistent, and cost effective. The very nature of our bespoke office cleaning service allows us to offer as much, or as little, as you need. Whether it’s a daily office clean, getting your premises ship shape for an important meeting, or regular cleanliness checks, Mum’s Helping Hands are here to help. Our most intense package is our daily office cleaning. Mum’s Helping Hands will send a cleaning specialist to your office/building every day at a pre-specified time to complete the cheklist of office cleaning jobs. How can we be sure of quality? As part of all of our office cleaning packages, we will supply you with our Quality Assurance Report. This report is completed on a monthly basis, and is used by our management to review the effectiveness of our service. Get in touch with Mum’s Helping Hands today to discuss your needs. Not looking for a daily clean? Not to worry. Mum’s Helping Hands pride ourselves on our flexibility, so we’ll be more than happy to work out a cleaning schedule for your office. Whether it’s twice a week, once a week, once a fortnight, or even once a month, we will be happy to be at your office on time and ready to clean. If you’ve got a small office that doesn’t require as intense a clean as our daily cleaning, or simply don’t have the budget for a daily cleaner, then this package is perfect for you. Call us today to discuss your requirements. Was the office party a little too hectic? Have you got an important client visiting, and want to ensure that your office looks it’s best? Then our one-off cleaning service is for you. If you don’t want to be tied to a contract, but need a cleaning specialist to ensure that your office is at its cleanest, we are more than happy to oblige. Mum’s Helping Hands can organise a one-off clean for an office any size, and will include any number of the services included in our standard office cleaning tasks, along with any additional services you may need. 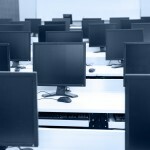 As part of our extensive office cleaning service, we include telephone and computer cleaning. Good IT and telephone hygeine is essential to any business that considers Health & Safety highly. It helps prevent illness in your workforce, reducing absences, potential litigation and equipment expenditure. Research has shown that keyboards and telephones can harbour incredible amounts of bacteria and viruses; up to 400 times the amount of a toilet seat! Mum’s Helping Hands offer monthly and quarterly contract specialist services, seperate to our office cleaning, including: surface cleaning of any office appliances, computer, screens, keyboards, mice, telephones, printer/fax machines, scanners, and photocopiers. A checklist is developed by MHH cleaning service management to communicate with the client’s needs and expectations to your allocated cleaner. The Quality Assurance Report is a monthly inspection used by management to review the quality of cleaning at your property is kept to a high standard. Our management process is supported with the use of Colour Coding to prevent cross contamination as equipment used in each area does not transfer germs. The list below are our standard office cleaning tasks, but remember, we are happy to tailor what we do to meet the needs of your office, just discuss it with one of our representatives.